Comparing dog foods is no easy task. The labeling can be hard to decipher, and many of dog owners are left wondering which brand is really the most nutritious. When you also throw in the choice of whether to feed dry or canned food, the waters get even muddier. First, you need to understand what the guaranteed analysis really means, and then learn how to convert those nutrient percentages into numbers you can compare across all pet food brands and types. The Association of American Feed Control Officers (AAFCO) is the regulatory body that sets the standards for the nutritional content of dog food and other animal feeds. By law, all pet foods must meet AAFCO's minimum requirements to be labeled 100% nutritionally complete. However, just because a pet food meets AAFCO's minimum requirements still doesn't guarantee that all dog foods are of equal quality. Is Raw Food Best for My Cat? Two dry dog foods may actually contain 18% minimum protein; however, the source of that protein determines how digestible it is. Real meat and less expensive meat by-products both have protein contents. However, real meat is typically easier to digest, and therefore your dog is able to absorb more of the nutrients as the food passes through his system. Greater absorption of nutrients equals lower stool volume because more of the food has been completely digested. The question of digestibility also pertains to the rest of the ingredients in your pet's food. If your dog can't pull the entire value of nutrients from them, what good are they? So why don't all dog foods use the most digestible, high-quality ingredients? Using lesser-quality, inexpensive ingredients that still allow the food to meet AAFCO standards increases the manufacturer's profit margin. The rule of thumb for dog food is this: The lower the concentration of the nutrients, the larger the required serving size to attain the recommended amount of nutrition. Canned dog food typically has higher water content than dry kibble, which means you may have to serve your dog a larger serving of canned dog food to obtain the same amount of nutrients as contained in a smaller serving of dry kibble. That's not necessarily a bad thing, as long as you understand the difference. Both forms of food can benefit your pet, and it's never a good idea to feed a single brand or type of food exclusively. That said, water content alone cannot tell you if one food brand is higher in actual nutritional content than another. For that, you need to look at the guaranteed analysis and learn to decipher its true meaning. 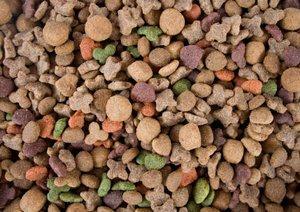 AAFCO actually bases their requirements for 100% nutritionally complete dog food strictly on the "dry matter" content. However, the analysis tables on nearly all dog food labels have been converted to reflect each package's feeding recommendations. This analysis can be a bit confusing, since the amount of food you need to feed in order to get the guaranteed results varies from brand to brand. If you want to make a truly informed comparison, you need to view these percentages the same way AAFCO does, by dry matter content. According to the Ohio State University Veterinary Medical Center, "Comparing food on a dry matter basis takes differences in water content out of the equation so nutrients are compared on a common basis." Here is the formula to help you convert the guaranteed analysis table into a dry matter profile for easier comparison. Begin at 100%, and subtract the percentage of moisture listed on the label. This gives you the actual percentage of dry matter in the food product. Take the listed percentage of one of the main nutrients, and divide that number by the percentage of dry matter. This will give you the actual dry matter percentage of that particular nutrient in the food. Repeat the process for each nutrient in the guaranteed analysis table on the package. As an example, say the water content of a particular brand of canned dog food is listed as 75%, and the crude protein content analysis is guaranteed to be a minimum of 6%. Subtract the 75% (.75) water content from the 100% (1.0) total product, and that leaves 25% (0.25) dry matter. Divide that 6% (0.06) protein content by the 25% (0.25) dry matter, and you get a dry matter protein content of 24% (0.24). Now a bag of dry dog food carries considerably less moisture. Using the same formula, a product that contains 6% (0.06) moisture contains a dry matter content of 94% (0.94). If the crude minimum protein analysis is 18%, dividing that number (0.18) by the amount of dry matter (0.94) rounds out to a dry matter protein content between 19% and 20% (or 0.1914893617021277 to be exact). In this instance, the dry food contains lower protein content than the canned, but the results will vary as the percentages change from brand to brand, which is the entire point of converting to dry matter percentages for comparison. Now that you know the formula, you can convert the other crude nutrient percentages listed in any guaranteed analysis table into a number that can truly be compared from one dog food to the next. This will help you make the best food choices for your pet based on his personal needs, which your veterinarian can help you assess.